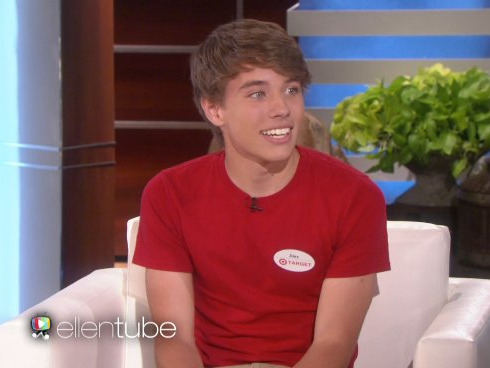 “Alex from Target” has become a controversial figure. The teen became an overnight sensation after a photo of him working the checkout counter at Target went viral and teenage girls started gushing over his looks. Since then, a marketing company has claimed and then backtracked responsibility for his fame. Target denies having anything to do with the image spreading. We don’t generally traffic in conspiracy theories. But there are a few red flags that make us suspect that Target is behind Alex’s moment in the spotlight after all. No one can pinpoint how the image spread. In many viral news stories, such as the Overly Attached Girlfriend meme, the source of the image is clear. But reports on Alex from Target have been conflicting, with many top news outlets saying they can’t find the original person who tweeted the image. Yesterday, Buzzfeed reported that teen Twitter user @brooklynjreiff first posted the image. Her photo, posted Oct. 26, was tweeted to a friend and did not include a caption. There are only two responses to the image until November 3, at which point it had already gone viral. Breakr’s CEO probably wouldn’t be dumb enough to lie about the stunt. The social media startup’s CEO told CNET that the hype was nothing but a carefully planned marketing campaign. “Truly, we never thought it’d go this far, but it proved that with a strong fan base and rally the fangirls, you can,” he said. He also claimed that Alex had given permission for his photo to be taken. The company later backtracked, saying that it only helped the image spread through its Twitter fanbase. (Because the company has fewer than 2,000 followers, it’s questionable how much influence it would have had.) If Breakr is telling the truth about not working with Target, why would they have an incentive to promote the photo? It took Alex a surprisingly long time to speak to the press. The photo of Alex began going viral over the weekend. But the teen didn’t have any contact with the press until he retweeted Ellen Degeneres on Monday. Generally, when an ordinary citizen finds fame, that person is quick to respond to media requests. But Buzzfeed, the first site to cover the hype, was unsuccessful in getting a hold of him, as were dozens of other top news organisations. Alex’s silence until he went on The Ellen Degeneres Show suggests a carefully planned, exclusive agreement between the two. Target, which has faced declining sales recently, could use some positive press. It’s not unreasonable that the company could be behind the stunt. To be clear, these are all conjectures, and the company has publicly denied involvement.